The VP-100 Dagger is phenomenal. It is designed to be extremely strong and it did not disappoint. 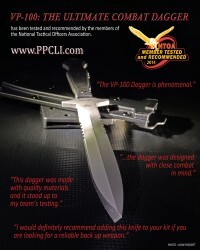 There's no easy way to say it, but the dagger was designed with close combat in mind. It is a very durable knife. The sheath is solid and versatile. It can be worn several ways and is easy to use. It is a great piece of equipment and is clearly built very well. This dagger was made with quality materials and it stood up to my team's testing. I think it would be somewhat rare to be in a situation where there would be a need to use a weapon like this in a hand-to-hand environment but it still can be a handy tool to have on your kit if the need ever arose. The VP-100 Combat Dagger is a very sturdy knife. This is a purpose built knife. Its purpose, combat. The blade on this knife is extremely sturdy. No flex at all. I liked the fact that it was a one piece blade/handle combination. The unique tip and the double beveled edges make this the ideal knife to use if needed in a tactical operation as a backup weapon. Overall, this is a very well-constructed weapon. I would definitely recommend adding this knife to your kit if you are looking for a reliable back up weapon.